This month I've been eating a lot of my Chunky Monkey Overnight Oats for breakfast Now I'm not a banana fan, but I do like the Chunky Monkey flavor. Chobani stopped making the banana yogurt I used to buy so I had to try out their other flavors and wanted to share my review. First off it's hard to find banana yogurt, I have to go to several grocery stores. I like Chobani because it's made with milk from cows not treated with hormones like rBST and has no artificial ingredients. 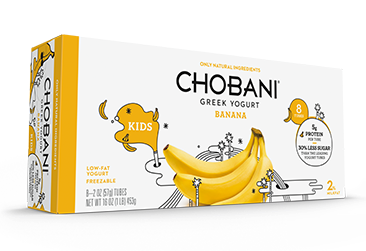 First up is Chobani's kids yogurt which had the most authentic flavor. I used two packets of this to make one serving of yogurt. The nutritional value of two packets is 100 cal, 12g sugar, 10g protein. 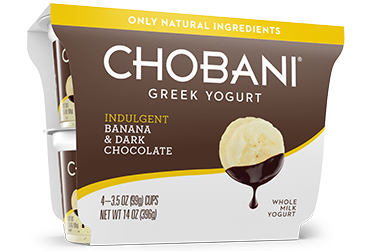 Chobani Indulgent Banana &Dark Chocolate flavor was a let down for me. I hardly noticed or tasted the chocolate in it. It tasted very artificial to me. The cups are much smaller than regular yogurt. The nutritional value is 140 cal, 12g sugar, 7g protein. 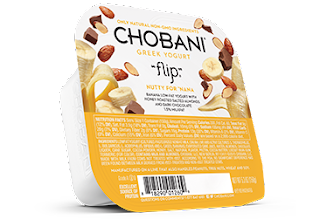 Chobani Flip Nutty for 'Nana is part yogurt and part topping and labeled as banana yogurt with slivered almonds and chocolate chunks. Well the yogurt barely had a banana flavor to it, it was more of a tart plain yogurt taste. I thought the almonds were overwhelming. The nutritional value is 200 cal, 16g sugar, 13g protein. 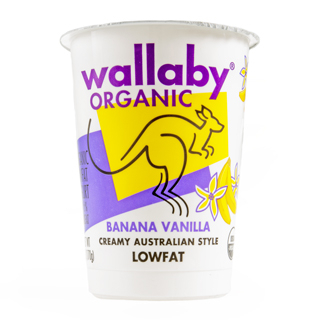 Wallaby is Australian style yogurt made using organic milk from cows raised on local, pasture-based farms in Northern California. I think the vanilla takes away from the banana flavor plus this is way too high in sugar! The nutritional value is 140 cal, 20g sugar, 6g protein.